This article sums up the situation best for me. I know Maryanne, she is an exemplary mother, community member and artist. Her daughter needed an amputation at birth and she has nurtured her into a dancer, swimmer, student of talent and promise. This situation is an outrage. Please pass this information on and come to the Rally in support of Justice for Maryanne Godboldo. She home schooled her daughter and was considering a middle school which is why she began immunizations. The Rally is Saturday at Hartford at 9:00 AM. Last year, the Detroit mother went to the Children’s Center, a group that works with troubled children, to seek advice and a treatment plan for her 13-year-old daughter. The girl, who’d never had behavioral problems before, was suddenly irritable and not her usual self following a series of immunization shots. As part of the center’s treatment plan, a doctor prescribed the child an anti-psychotic medication. But the child’s symptoms only worsened. As a result, Godboldo sought another physician, who quickly recommended taking the child off the psychotropic drug. The mother agreed and, according to her attorney, who spoke exclusively with MLive Detroit earlier today, Godboldo began following that doctor’s orders. Unfortunately for Godboldo, the state didn’t agree. Child Protective Services wanted Godboldo’s child medicated according the center’s plan, and CPS workers essentially told the 56-year-old mother — who was never under any court order to follow the plan — to agree to their program or surrender her child. She refused both. And so, on Thursday, CPS workers showed up at Godboldo’s house with the police, who said they had a warrant to take the child. But according to Godboldo’s lawyer, Wanda A. Evans, officers never produced a warrant even after Godboldo repeatedly asked to see one. A standoff ensued. A gunshot was fired from inside the house — though, according to Evans, not at officers. Finally, after long hours of tense negotiations, Godboldo — a mother, a teacher, a dancer and a respected figure in the city’s arts circles — surrendered, was jailed and, on Sunday, was arraigned on multiple felony charges. March 28, Detroit News: Godboldo is accused of barricading herself inside her west side home with her 13-year-old daughter and a gun after being confronted Thursday afternoon by Child Protective Services workers who had a warrant to remove the girl because the mother had withheld her medication. Detroit Police said Godboldo fired a shot and refused to leave the home until negotiators, including a Wayne County judge, helped talk her into surrendering. But for now, at least, the drugs are off the table. A Wayne County Circuit Court judge ordered the medication discontinued until further review. How isn’t this entire incident a travesty? How does a woman who voluntarily goes looking for help wind up behind bars because she’s trying to do what she thinks is right by her child? How can the state make a mom who, by all accounts, has done a wonderful job of parenting give her child medicine that she and a doctor both think only worsens a problem? And how is it that we can respect a judge ordering the child off the medication but not a mother acting on her physician’s advice? Hell, this isn’t about vaccines even: Godboldo had gone along with the shots. She wasn’t some religious nut denying her child a life-saving medical treatment. This was a mother who, along with her doctor, didn’t believe her child benefited from psychotropic drugs. As Judge Thomas’ remarks suggest, the incident has sparked shock and outrage among many in Detroit who believe that Child Protective Services overreacted (and that state agencies are often far too quick to recommend medication for kids, especially black children). 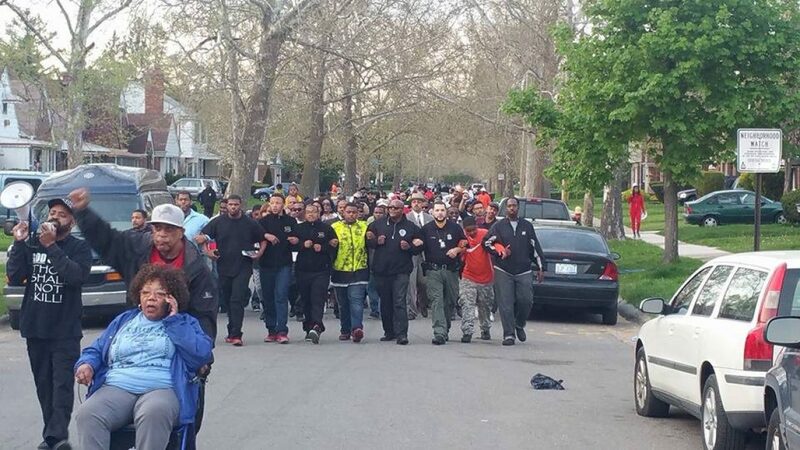 A rally of support for Godboldo is being held at Detroit’s Hartford Memorial Church on April 2. I doubt that anybody’s trying to justify standoffs with cops or warning shots or any of the other sensational elements of this incident. But early evidence strongly suggests that the CPS workers overstepped their bounds in a major way. Inconsiderate, Ill-informed Governor Cuts Reentry Programs and breakd February 19th promise!!!!!! !